The only replacement I can source locally here in New Zealand is part number A 005 431 71 12 Q1 will this still work my vehicle is a 2005 E55 ?? Thanks do you have this part in stock please? I don't show that number in my system, based on your model year I suspect you need a 0054317312 equivalent however feel free to send me your VIN so that I can confirm what matches. EPC shows 0054317312 replaced by 0054318112, see attachment. Please note, I have not added the E-Class models to the fitment guide however it is compatible. I really should learn how to use half of the other programs on my Star tool other then Xentry. I see www.eeuroparts.com is now offering a Mercedes-Benz Electronic Brake Service Tool that can Deactivate/Re-activate SBC and change brake fluid for $24.99 (3 week Rental). Looks interesting. Last edited by Gangrene3075; 04-06-2017 at 03:10 PM. I see www.eeuroparts.com is now offering a Mercedes-Benz Electronic Brake Service Tool that can Deactivate/Re-activate SBC and change brake fluid for $24.99. Looks interesting. are very knowledgeable. If they sell it then it's good. I have Star so it's a moot point for me but I assume many people would benefit from this tool. Yeah its nice there are options now / more information on what OBD will work with SBC. I was looking at this system it allows you to disable brakes its called the EP21 according to the sticker. Only down side people have stated on reviews is that does not pull codes only disables brakes and on certain models. Thought I would give a small update, SBC unit is doing great no squishy pedal or anything. I did however find out my new SBC unit now has SBC hold option. Not sure if they were programmed that way for USA, however mine has it. Not sure of how to turn it off in Xentry if I ever wanted to. Found this out by accident when stretching my legs and pressed the brake pedal further down. Hold up! Just to be clear, you didn't have SBC H before you swapped out the SBC pump? I know that cars before march 2003 did not have it. My 2002 E500 does not have it and I need to replace my pump, im deciding whether or not to sell the car or replace the pump, getting SBC H is a big PRO reason not selling the car lol. Hey CDI, can you tell me the part number of your old sbc and your new sbc unit please. The only numbers I have are in the photos, I can get the new SBC unit number however it will be a while not near my car. people getting rid of their worm sbc, pm me. Did you ever try this with the iCarsoft MB II? I have same concern - I bought the icarsoft MBII to read codes and do some ABC and brake work on my SL500. The MBII does disable the SBC for pad changes and it gives a scary red brake SBC failure warning but no real feedback other than turning it back on to get rid of error message. I'd guess that if I tried this SBC replacement that I could not activate the counter without the Mercedes shop machine. Is that the only way? Should I replace SBC for my '03 E500 too? First, Thanks OP for the great write up. 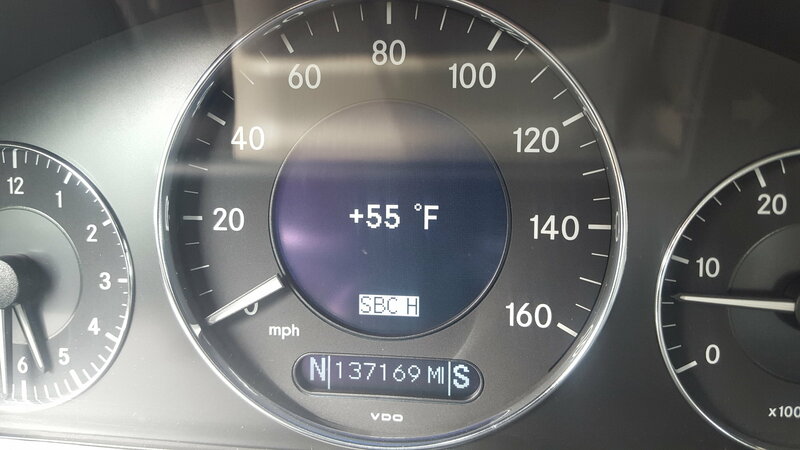 I bought my '03 E500 a year ago, the odo is 106000 miles now. I did valve gaskets and breathing hoses replacement, rear main seal replacement with complete ATF flush, steering fluid replacement, rear transfer case/differential fluid replacement. I also replace brake pads and flush brake fluid without knowing that SBC need to be deactivated. The car run very nice except the brake warning. IC shows the White brake service warning, sometime it shows RED warning and the car actually stop the for couple times. I replace brake pedal switch without reset its counter. Sometime my scanner show auxiliary bat went bad but its measure was 12v plus. I heard that my '03 E500 model has known SBC unit defect. I don't know if it ever been replace. Sometime I heard the SBC sound very loud. Well, before i drop $1500 for the SBC, Aux bat, Brake fluid and tool from the link at post #84 I love to have some advice from you guys. Did I miss anything or the SBC actually went bad. I am seeking advice regarding repair of a 2004 e320 base wagon. About a month ago the rear air suspension went out and I replaced both rear air springs following the DIY instructions on the forum. Everything went well, suspension worked fine after the repair for a month or so. Then the brake pad wear sensor message began to be displayed on the vehicle. I knew the back brake pads were like new so I read the DIY for front brake pad and rotor replacement (disconnect negative battery terminal, disconnect SBC, replace pads and rotors one wheel at a time as outlined, pump brake pedal, check brake fluid level, connect SBC and then the battery). However, the driver side brake wear sensor was broken when I did this so I installed without the sensor ( ). When I started the vehicle, the red stop sign with BRAKE symbol was shown and the vehicle was locked in park. I then purchased the sensor, repeated the preparation steps in the repair process and installed the sensor hoping that would resolve the issue. After installation as before, the EPS, ABS and Brake malfunction messages were displayed and the transmission was locked in park. From the forum it was clear the next step was to obtain a Master Inquiry to determine when and if the SBC unit had been replaced in the past. The unit was replaced in Oct. 2014, the vehicle has been driven 30K miles since replacement. Reading posts from others it seemed the next thing to do was to obtain the STAR diagnosis and code report. I had the vehicle towed to the nearest dealer (40 miles), waited 3 days for the dealer diagnosis and I now have the codes. The codes are C249B, C24CD, P2404, P2010, 9033, 9034 and 9092. The dealer (Fresno, CA) would not give me a printout of the codes, but he said these are the main ones which all indicate SBC control unit replacement ($2417 plus tax). I have several questions for the forum. Does it seem plausible that the SBC unit would be bad after 30K miles and 3 years? Second, if so, should I consider replacing this myself (I read the DIY SBC unit replacement instructions which required the STAR diagnosis equipment, with a cost of ~$1K for parts and then the additional cost of the STAR equipment and Dell HDD.) or is this something I should just go ahead and accept as a consequence of buying a high maintenance vehicle? Thank you for all of the excellent info on this forum and in advance for any advice on this topic!! change the brake pedal sensor, second check whether the sensors are installed correctly, I would assume that brought the problem and reset.. If you do everything at the dealer,, then yes, it will be really expensive.. Thank you for your insight and suggestions. I will replace the brake pedal sensor. I assume that after replacement of the sensor I will need a shop to reset the codes, etc.? Before towing to the dealer, I had removed the tire and double-checked to ensure the sensors were inserted fully and installed correctly with the driver side sensor on the driver side, etc. (that assumes that the handwritten labels identifying driver/passenger side were correct, which also guided which pads went on each side). So I do not believe the sensors are installed correctly. I had not thought of searching for such shops, there are several within 30 miles of my home. ink that is the issue. This car is my fifth Mercedes, and my wife loves the car but it seems to be considerably higher maintenance than the others. When I had the sbc bad, I would let the car sit for a couple of hours, then it will reset everything, even all those sbc errors and you could move it out of park. Yes, indie are in this case mb specialist that are not the dealer. I've seen that in the usa they charge from 80 to 150 I think to check the car with the computer and reset it. Who knows, maybe erasing all the codes will fix the issue, but surely the sd computer will tell you exactly what it is, sbc pump coes can be triggered by a lot of things. Well, true and false.. I'm dying all my faults, like the heat exchange valve which is just 50 usd, the transmission which all around is like 300 usd, parking sensors 25 usd.. It's an expensive repairs depending if it's on the dealer and where you source the parts. Last edited by cMazara; 09-11-2017 at 08:15 AM. Is it possible to use the iCarsoft MB II instead of the Star/Multiplexer for this procedure? you can disable the sbc, but that’s it. Changing the sbc involves a few steps in sequence that the star has, bleed corner by corner, check pressure and values.